So I have read some reviews on the 4.5" coils that they are not really worth getting and either go with the 3.5" or 5.5" depending on your style of driving. Mind you this is for a XJ so what is your experiences with them? I plan to run 33" tires on mine in the future so collecting parts now for my 1989. Some have said the 4.5" have lower weight rating compared to 3.5 and 5.5 but I suppose that depends again on what style of driving I would be doing on road or off road. Well off-road primarily and not rocks unless it was basic stuff at the moment just trails, mud! 25 views so far and not one person has anything to say? I know there are a lot of XJ's out there running 4.5" Rubicon Express coils and if you are one of them please let me know how you feel about them???? In addition, since mine is 1989 what would I need to purchase to say make the rear level? Like leaf packs, all new leafs? (subject to the ones on it are good or not but doubt they are), and of course maybe leaf relocation drop brackets? Just trying to see what is needed so that when I get home in two months parts will be there waiting and I can start wrenching. Thank you all in advance if you happen to provide some input. It would have helped if you posted in the XJ section, not the Grand Cherokee section. I have the 3.5" coils in mine. They gave me a little over 4" of lift. I think they ride just fine. I also dont have any sway bars and it feels more stable then when it was stock with 2 sway bars. You are also correct when you say the 4.5" coils have a softer spring rate then the 3.5" springs. For my rear, I did the RE 3.5" leafs and removed the 2nd from the bottom leaf. I also went with HD Offroad no lift shackle relocation brackets and Core 4x4 shackles. This made it sit even with the front. Here is an older picture. The rear has settled down a bit since then. Yea I have been actually reading your thread as we speak!!! Nice Jeep by the way and love the work you have done on yours. I didn't realize my post went into the Grand Cherokee section (Moderators can you please move to correct location?) was meant for XJ. Attention to detail I suppose. I did read the 4.5" were softer which I don't understand why but if it still gives me 4-5" of lift I will be happy. Off road it may be a little more squishy than say the 3.5 or 5.5 but I can probably live with that. I asked the question becuase I pulled the trigger on the 4.5" for a good deal before knowing all the bad reviews on them. I could send them back and order the 3.5 or some other brand but we will see. Last edited by XJIrish4x4; 10-04-2017 at 10:18 PM. Perhaps I could keep the 4.5" coils up front and run the 3.5" RE leafs in the back with drop brackets and that would give me the height I would need in the rear to match the front. Anyone have 4.5" coils on there's to offer what rear setup they went with? The 4.5" coils will give you over a 5" lift if you dont have an aftermarket bumper and winch. If you do, it will give you 4.5". Are you also ready to do aftermarket steering, a sye, longer brake lines and a track bar? Its all needed when you hit the magical 5" number and most of it for 4". Yea I'm ready to pull the trigger on all that stuff I will need for the lift. Once I get home I will have plenty of other stuf to clean up on it before I will ever get off road with it. I have all winter to get it ready so no rush at all. This will give me more than enough time to scrounge for all the necessary parts. Needed is steering system what exact parts do I need to upgrade? Everything? Brake Lines I can order today, SYE is not a big deal either just money but that will come with time, track bar what is the best brand to go with? I'm two months away from getting home from deployment anyhow so I have nothing but time to research and order parts and have them waiting for when I get home. I don't have endless money to throw at it but with time I can save for anything I need. Looking for the basic break down of what is necessary to at least get me going. Stock everything on it right now except it does have 32x11.5x15" tires. I got the rig next to nothing and it is waiting for me to pickup once I get home so I know I will need to go through it well and probably have plenty of other items to fix on it like basic mechanical stuff. Who knows it could even have a basic lift on it considering it is running those tires which I didn't think were stock. It already has the roof rack with spare brand new tire mounted on it. THe easiest and cheapest is to upgrade to the ZJ steering. above that, you start diving in to 1-ton steering and heim joint steering. Adjustable track bar(rubicon express) i Reccomend getting the brace and frame bracket that goes with it. 4.75-5" on 32's with trimmed flares is a great combo to start out at. check my XJ build thread, thats almost exactly what i was at. Thanks for your feedback... I did start this on the correct thread now by the way so hope that helped and it draw it a little more attention. Here is a quick photo of my dirty rig but only one I have until I get home. Looks like I'm right on track with what I need then. What size leafs did you go with in the rear and did you use relocation brackets and aftermarket shackles? I will check out your build now. Last edited by XJIrish4x4; 10-05-2017 at 01:20 PM. 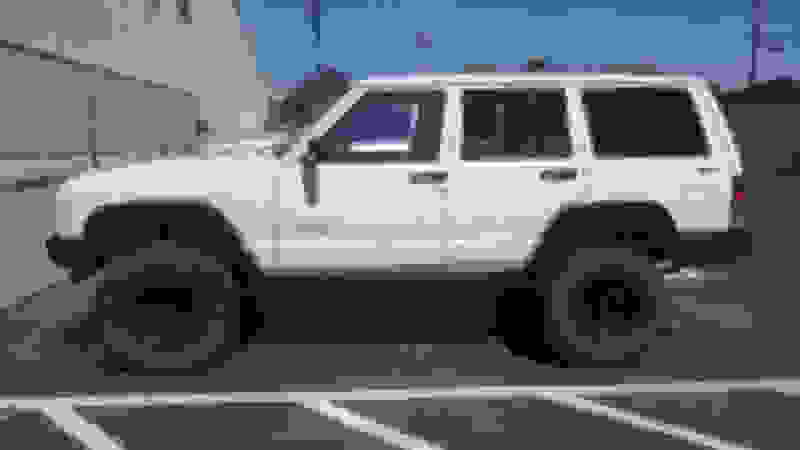 [QUOTE=WyoCherokee;3428046]THe easiest and cheapest is to upgrade to the ZJ steering. above that, you start diving in to 1-ton steering and heim joint steering. You mentioned the upgrade to ZJ steering assuming if I can find that in the pick u parts or order online what size do you need to go with 5/8" or 1/2"? i have a xj lifted 3 inches what do you think would be the best way to go up a inch to run 32 or 33s?